1) Quarter the peppers and remove the seeds, stems, and veins. (The seeds, stems, and veins are what make the peppers HOTter). Immerse peppers into boiling water for 3 minutes; drain. Invert peppers on paper towels and drain well. 2) Place the peppers in a well greased 2-qt square baking dish. 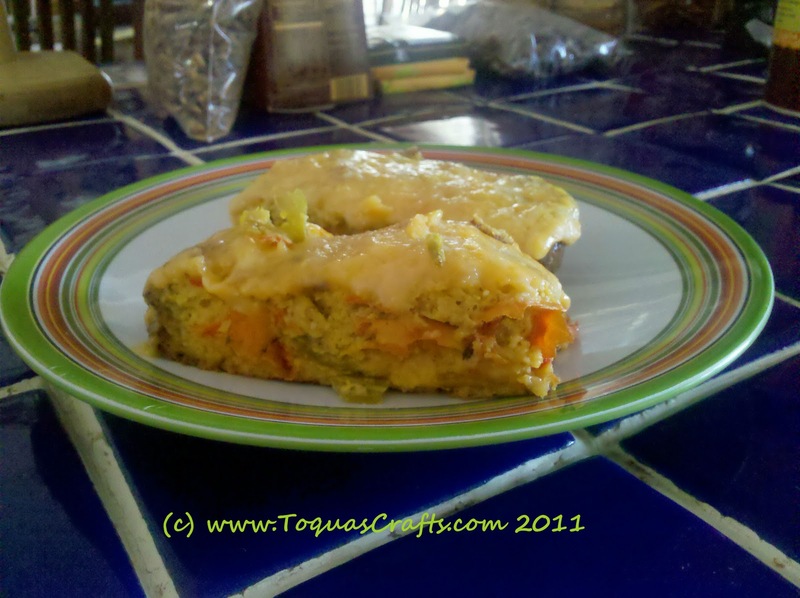 Top with 1 cup cheese. 3) In medium bowl combine eggs and milk. Add flour, baking powder, cayenne pepper and salt. Beat until smooth with a rotary beater (or whisk). Pour egg mixture over peppers and cheese. 4) Bake uncovered in a 450 degree oven about 15 minutes or until a knife inserted into the egg mixture comes out clean. Sprinkle remaining 1/2 cup cheese on top. Let stand about 5 minutes or until cheese melts. (I generally leave mine in the turned off warm oven to melt the cheese). Poblano Chili Peppers -or- Anaheim Chili Peppers -or- Pasilla Chili Peppers -or- Green Bell Peppers (for those that want absolutely NO HEAT what-so-ever). My husband and I thought this was good... well so-so good. We both thought it could use more peppers. The other day I purchased a couple of bags of freshly roasted chilies at the local supermarket. (They were selling sandwich zip-lock bags for $5 each as a fund raiser for breast cancer). I had used one bag in an aioli recipe and had one bag left over... I decided to make this recipe with it! I then cut up the peppers into bite sized pieces. I decided to bake this in a 9x13 dish, so I basically doubled the recipe. Instead of the flour I used polenta (cornmeal). (For those with gluten intolerances this allows you to eat this... unfortunately if you also have egg and milk allergies I did not remove those issues with these adjustments.) I used a full cup of polenta... this is more than "double" the recipe. OH MY!!! My husband and I both think these changes truly *MAKE* the recipe!! I'd invite you over for a bite... but there's only one small piece left! And... I think I'm having that for lunch tomorrow! WOW! That looks sooooo fantastic! My hubby would love if I made that! Thanks for sharing the recipe! It is SUPER delicious... especially with the changes I made! Wow - this sounds great! 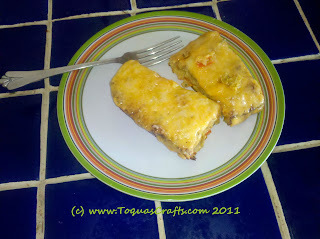 I have never made a chili Rellenos but might give it a whirl now!